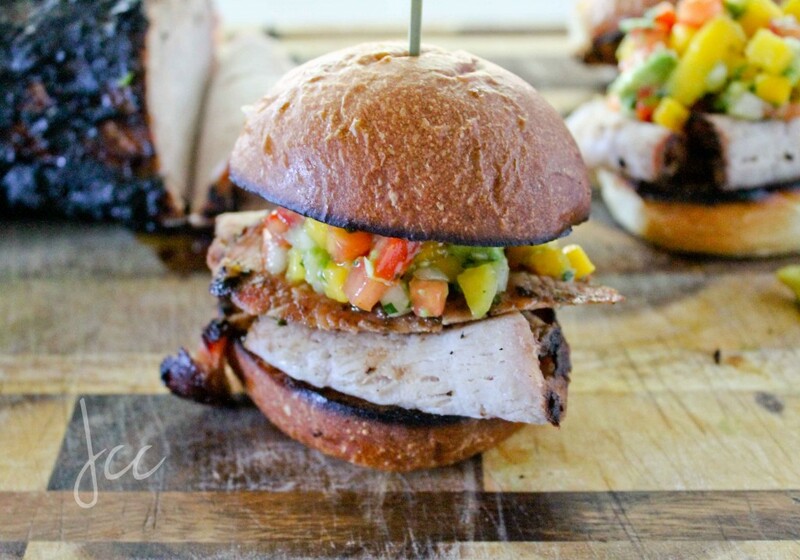 Last Jerk recipe for a while…I promise! It’s just that I’ve been cooking a lot of jerk lately, it’s become an addiction and since I share some of my recipes with you guys, you’ve been bombarded with it. Sometimes I like to experiment with the classics and add a new spin to it. For this recipe I wanted something that’s both spicy and sweet, so I added quite a bit of brown sugar to the classic jerk marinade. The pork loin was slathered with jerk seasoning and then I let it sit for 24 hours in the marinade. I then grilled the entire loin. 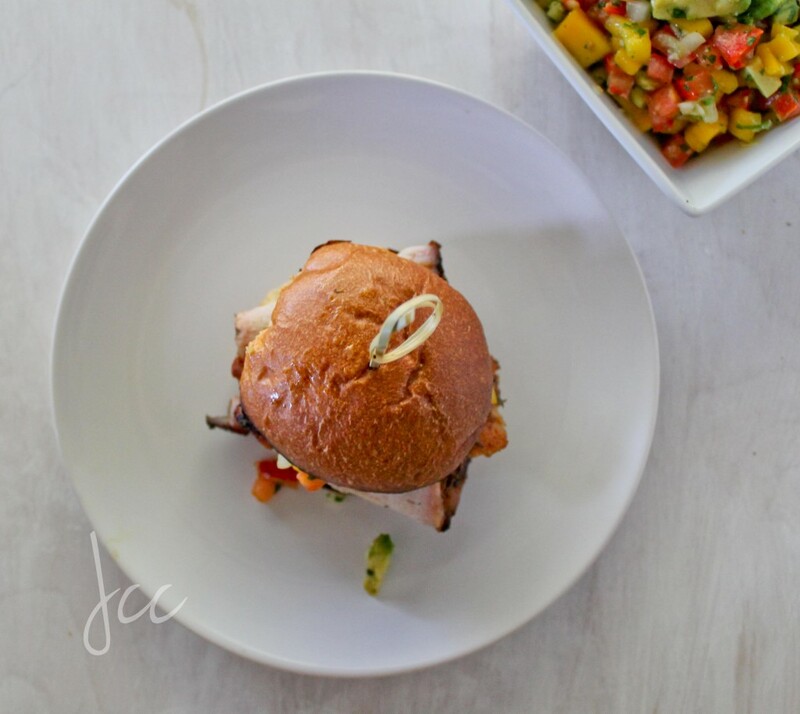 I wanted to serve the Jerk Pork differently than what was expected so I decided to make jerk pork sliders. 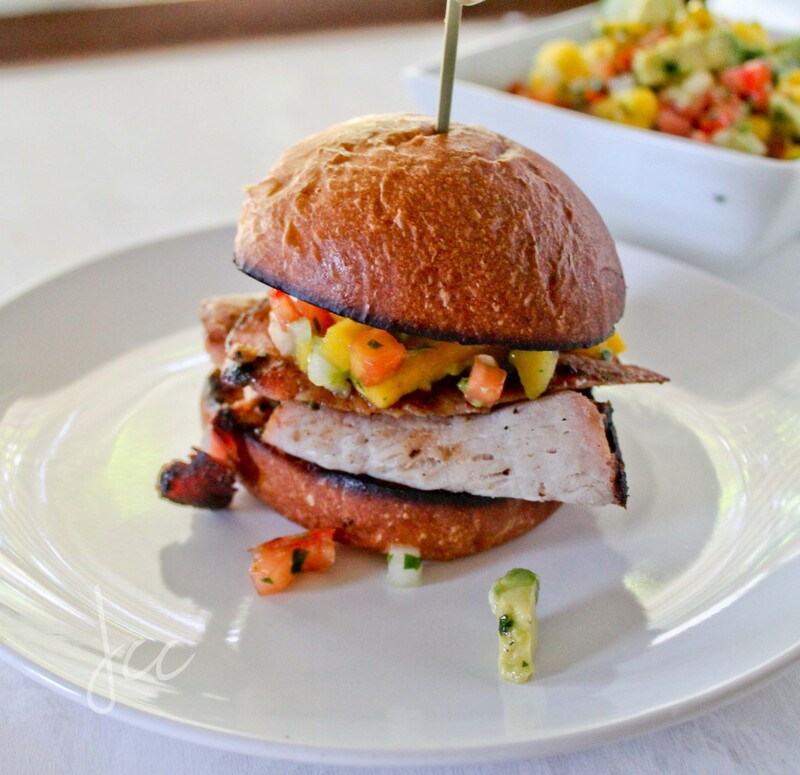 I thinly sliced the pork and served it on a toasted buttered bun with mango avocado salsa. 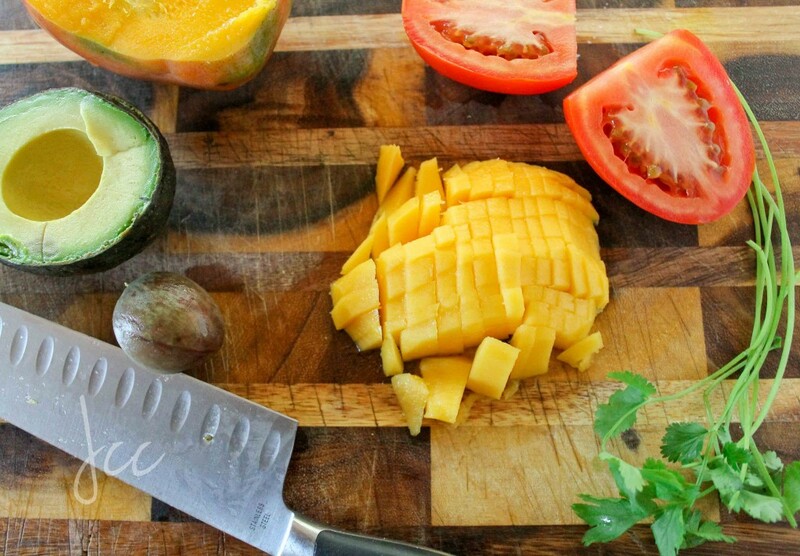 I make this mango avocado salsa all the time; it’s quick and simple and absolutely delicious. The combination of jerk pork and the salsa was out of this world! The pork was so juicy that I didn’t bother to serve it with any sauce because it didn’t need it. These disappeared in no time and in my home that’s always a good sign! With Memorial Weekend approaching, I think this would be a great recipe to add to the menu that’s a bit different from the normal burger and hot dogs. Whether to you choose to served the Jerk Pork as I’ve done or keep it classic, you won’t be disappointed. 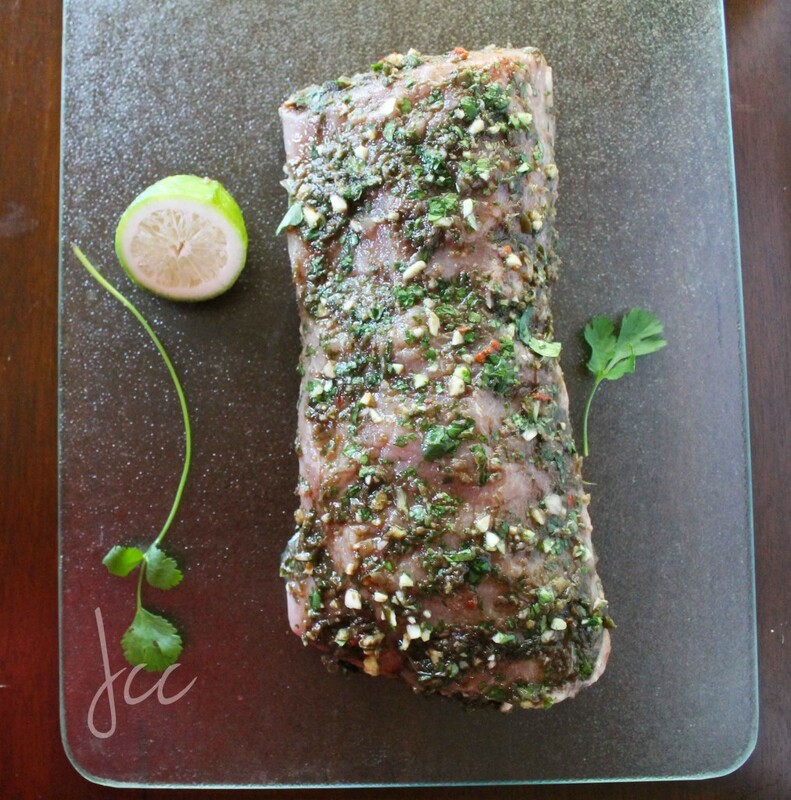 Place garlic, cilantro, brown sugar, juice of lime, jerk seasoning (except 1 tbsp of jerk seasoning) in a small bowl, mix then rub all over the pork loin. Place in a large Ziploc bag and place in the fridge, allow to marinate overnight. Remove from fridge 1 hour prior to grilling so that the pork can come to room temperature. Remove pork from marinade and rub with the reserved tablespoon of jerk seasoning. Over medium direct heat, grill for 40 minutes or until it reaches an internal temperature of 145 degrees, turning a few times. Remove from grill then allow the pork to sit for 15 minutes before slicing. To make the sliders, thinly slice the pork loin then place on burger buns that have been buttered and grilled until slightly charred. 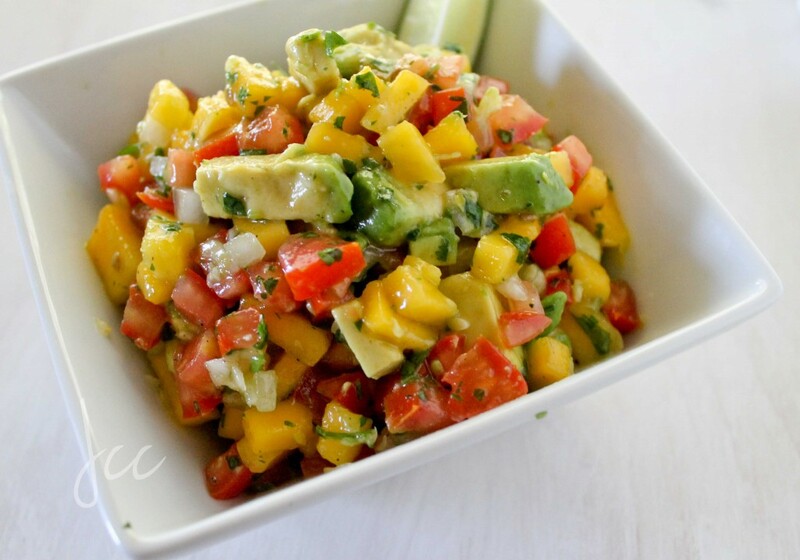 Top with a heaping tablespoon of mango salsa, and then serve. Place all ingredients in a bowl and stir to combine, making sure not to crush the avocado. Cover and refrigerate until ready to use. This blog is quickly becoming one of my favorites. Great recipes and beautiful photography I can’t wait to give some of your recipes a try. I’m drooling. I’ll be making this, and soon! Sweet and spicy! Yes! Love jerk seasoning on fish too. Hey, where’s that extra tablespoon of jerk seasoning go? Very curious…. Ha! Thanks for spotting this error. The extra tablespoon is added after the pork loin is removed from the marinade and before grilling. I added an extra tablespoon afterwards, because some of the seasoning is tossed out with the marinade and I wanted the jerk seasoning to form a crust when grilled. I don’t eat pork, but the combo of flavors sure do sound amazing. I’ve made something very similar but with salmon. Good stuff and definitely a winner! Your guests and clients will love this. I just discovered your site and it is already a favorite. When I see the pics of the food, my jaws proceed to drop, as everything looks miraculously delicious. I’m West Indian myself, and will try some of these recipes with my mom. Keep up the good work! Thanks Jared! Thank you for visiting.